My first exposure to great photography came when I was very young and a friend of mine showed me a photo his father had brought home. It was an Ansel Adams photo taken near the Merced River. The photo intrigued me profoundly and it set the course for a lifetime of photography even though I knew nothing of Adams, or the photo for that matter. The purpose of this blog is two-fold: to simply share photos and archive photos from previous posts in separate pages. If anyone would like further information on any photo, please use the comments area to let me know and I will be happy to share that information as well. Thanks for stopping. Hi Ken. I am really looking forward to this new blog – the couple of photos you have posted so far are totally my kind of thing! 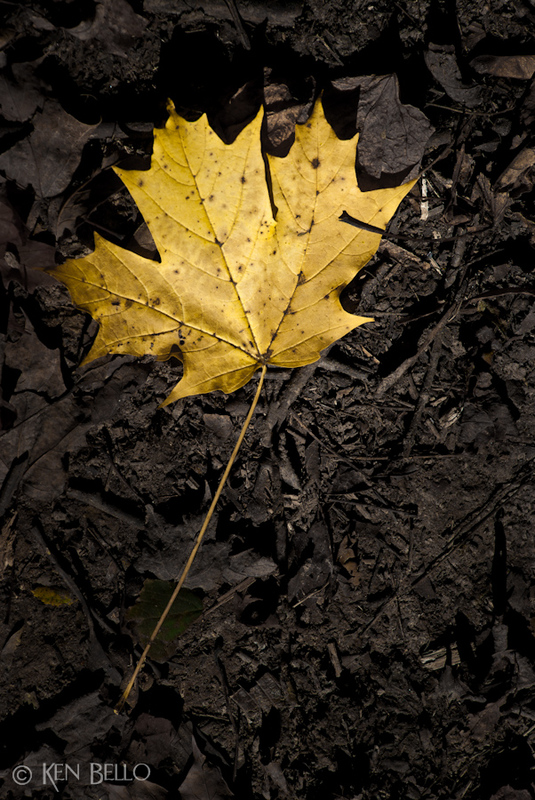 This leaf is wonderful – that background without the leaf could probably stand on its own very nicely. I am wondering if, in the absence of words except in the comments section, if you might keep a page going, or add to this page, from time to time with some of your observations about photography, your ideas and some of your methods too. Something that grows in one place, arising possibly from the comments as you go along, but compiled into a text that is easily found? I guess a digest of some kind. I know with your old blog that very interesting things came up in the comments from time to time. Otherwise, I really like the idea of the photo speaking for itself with no words, and no facts interfering either. What do you think about titles for the images, other than frame numbers? It seems that most exhibiting photographers include a title, and often these do open the mind of the viewer in a way that the photo alone might fail to do – not for want of good photography, but for want of sufficiently wide open minds viewing them. It would be interesting to know your thoughts on that topic. Thanks, ehpem. I appreciate the comment. I haven’t planned on keeping a page with any information or observations for this blog but I will elaborate more on the other blog 2clicksaway. That blog is what I would refer to as a general purpose photo blog as opposed to this one. Some photos will probably be the same on each blog since I’m not that prolific. So far the titles have been numbers that don’t mean anything to anyone else but myself. The numbers are actually the sequential numbers assigned by the camera and makes searching for the master file very easy. I never change that number when I upload files. However, I’ve been chided before for my lack of creativity in assigning titles to photos and may, on occasion, try to come up with an appropriate title. It’s something I really want to do but sometimes my mind is a complete blank for titles, hence the numbers. One additional comment – why no like button? Is it a protest against likes that are more a form of currency seeking reciprocal liking and views, or part of keeping the design minimal and clean? Sometimes I don’t have a lot to say other than that I like what I see, and a like button serves very well for that purpose:). Thanks, ehpem. For some reason the LIKE button does not show up in home page mode but only when you click on the post title for each individual post, unlike your blog. I would like it to show under each photo but I not sure how to do it. It could be theme related but if you know how to get it to show under each photo, let me know and I’ll definitely make the change. The only place I know of for like buttons is: dashboard>settings>sharing>WP.com likes (last item on that page). I am very much impressed and not the least bit shocked that you got this off the ground in record time. The big bonus is that your site is quite polished and sleek. The texture and depth in this photo work beautifully to help convey a time, place, and mood. It rises to Ken Bello standards—and that ain’t easy! Thanks, Anita. I was thinking about putting the “ABOUT” photo in rotation with some others. That’s way down the line, though. Thanks, Andy. I think this is going to work out well and I hope it has a broader appeal. Glad I found my way here. Thanks, JA. I, too, have a few Porter books which I got many years ago but still find inspirational.